Last week, the Cubs’ come-back win of the World Series was an inspiration to all. Even if you are not a Cubs fan, you have to respect the spirit and tenacity of a group of individuals who - against all odds - believe in a dream and fight for 108 years to achieve it. It’s a testament to the human spirit.And yet, I find myself to be not that surprised at what the team - indeed the entire Cubs organization - has accomplished these past few years. Why? Because I saw it coming. I wasn’t exactly sure when the Cubs pennant would be added to the line of World Series winning team flags that grace the roof at Wrigley. But I knew it would happen, and I knew it would happen soon. It was obvious from the Cubs’ leadership. 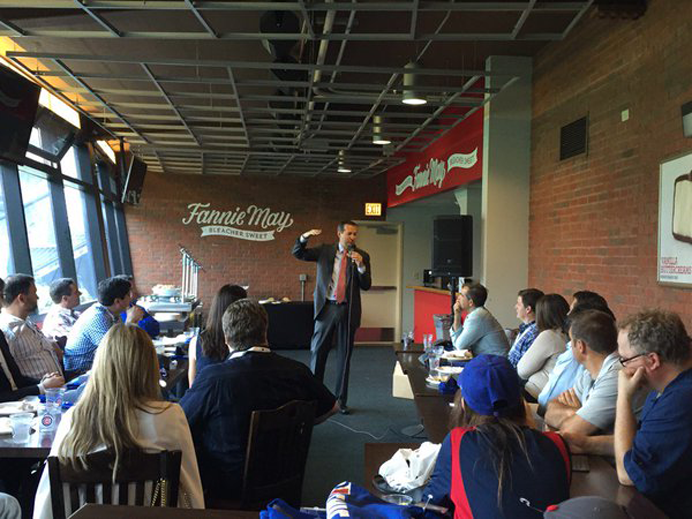 Last June, as chair of the Global Retail Marketing Association (GRMA), I had the opportunity to facilitate a Special Access Experience event at Wrigley Field for 20 Chief Marketing Officers from the country’s leading retail and QSR brands. We were joined by Tom Ricketts, Co-Owner and Chairman of the Cubs. Tom spent several hours with us, as he explained his priorities for the Cubs organization, and the key lessons that had shaped his vision for the team. In one of the most delightful afternoons in my recent career, Tom shared lessons for leading a winning sports team… lessons that I have used every day since to build business teams that also win big. Here are just three of the many leadership insights I gained from Tom that day. Tom: In baseball, players, management, investors and fans are all aligned around a single goal: to win the World Series. Back at the Office: In business, there can be many moving targets - which can also be distractions. Good leaders must be able to cut through the clutter and ensure every stakeholder is clear on what the top priority is. Thereafter, constant, open communications are essential to reinforce focus and to keep teams aligned and moving forward toward a single, focused win. Tom: If your team is winning at least 90% of the time, concentrate your efforts on what they need to maintain success and achieve incremental improvements. However, if your team is only winning 70-75% of the time, you need to develop a clear vision of what your “team of the future” must look like and work towards building it. Back at the Office: Leaders must have the vision to understand what a winning team looks like, along with an aggressive understanding of what “the right team” can accomplish. If the current line-up does not have the capacity to bring home the win, a true leader will make the tough choices required to recruit the team that can get the job done. And, you need to help the existing players understand that short term pains are necessary to realize long term gains. Tom: Be the best team on -- and off -- the field. Back at the Office: Business doesn’t stop when workers leave the office. Every organization - and every team member - is part of a broader community. Just as tired players have to muster a smile, an autograph, and a special appearance for their fans, so too should companies and workers find time to support and engage with their community. It’s an easy thing to overlook at the end of a challenging day, month or quarter. But in the end, you may come to need those fans. And besides, doesn’t the team draw energy from the cheers in the stands? What’s more, it’s the fans that ensure your ancillary businesses survive and thrive. Remember: as a company, you really can do well….by doing good. So thanks, Tom, for a great afternoon and some very valuable lessons. And thanks to the Cubbie players and the entire Cubs organization for one heckuva game! You reminded us that if we all pull together and keep our eye on the ball….we CAN make magic happen. Now it’s our turn at DemandJump, to “rip the cover off the ball”!